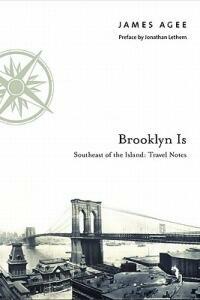 For the first time in book form-a great writer's classic celebration of the essence of Brooklyn. In 1939, James Agee was assigned to write an article on Brooklyn for a special issue of Fortune on New York City. The draft was rejected for "creative differences," and remained unpublished until it appeared in Esquire in 1968 under the title "Southeast of the Island: Travel Notes." Crossing the borough from the brownstone heights over the Brooklyn Bridge out through backstreet neighborhoods like Flatbush, Midwood, and Sheepshead Bay that roll silently to the sea, Agee captured in 10,000 remarkable words, the essence of a place and its people. Propulsive, lyrical, jazzy, and tender, its pitch-perfect descriptions endure even as Brooklyn changes; Agee's essay is a New York classic. Resonant with the rhythms of Hart Crane, Walt Whitman, and Thomas Wolfe, it takes its place alongside Alfred Kazin's A Walker in the City as a great writer's love-song to Brooklyn and alongside E. B. White's Here Is New York as an essential statement of the place so many call home. James Agee was born in Knoxville, Tennessee, in 1909. One of the great prose stylists of the past century, Agee wrote in many forms-poetry, short stories, novels, essays, commentary, and criticism. In 1958 he won the Pulitzer Prize for fiction for A Death in the Family, and he also wrote the classic account of poor Southern farmers, Let Us Now Praise Famous Men, accompanied by Walker Evans's documentary photographs. With John Huston, he wrote the Oscar-nominated screenplay for The African Queen, and he was an influential film and theater critic for Time and The Nation. James Agee died in 1955 of a heart attack in a New York City taxicab. In the fall of 2005, the Library of America will publish a two-volume collection of his writings. Jonathan Lethem's novels include Fortress of Solitude and Motherless Brooklyn, which won the National Book Critics Circle Award, his most recent book is The Disappointment Artist. Lethem was born and raised in Brooklyn, where he still lives.